It's no secret that the 1990s have been responsible for some pretty interesting trends. Extremely low rise pants, scrunchies, tube tops... those were just a couple of items that we would rather not be in trend again. But because fashion is cyclical, inspirations from that decade have been cropping up in various street wear and runway looks for a few years now, causing us to feel—dare we say it—nostalgia for fashion from that era? Like it or not, the movement is set to continue in 2019, and may even intensify, with more vivid colors, acid wash jeans, crop tops, and even a major comeback for... wait for it, cycling shorts. Here are four trends to look out for. With the exception of grunge, the '90s were dominated by flashy, fluorescent hues. Think highlighter-esque hues of pink, yellow and green that could stop traffic—perfect for the "look at me" attitude of our social media-obsessed generation. Expect a major comeback for this trend in 2019, whether it be in the form of small touches or more daring total looks. It's this season's standout trend, literally. A must-have material (and a Dolly Parton and Billy Idol staple), denim will be one of the stars of 2019, but only if it’s faded. Suitable for streetwear, retro, disco, and western looks, stonewashed denim is compatible with a multitude of styles and sources of inspiration, as demonstrated by Dior and Isabel Marant in their most recent shows. Whoever said that Kim Kardashian couldn't have an effect on fashion trends was obviously wrong. Frequently seen on the entire Kardashian-Jenner clan as they did everything from running errands in Calabasas to date night in Hollywood, these sporty creations have made a surprising comeback, much to the dismay of many veteran fashion addicts. Unlike their first time in the spotlight, cycling shorts have now been given a update with designers pairing them with crop tops, heels and stylish outerwear. Just leave the oversized t-shirts at home please. 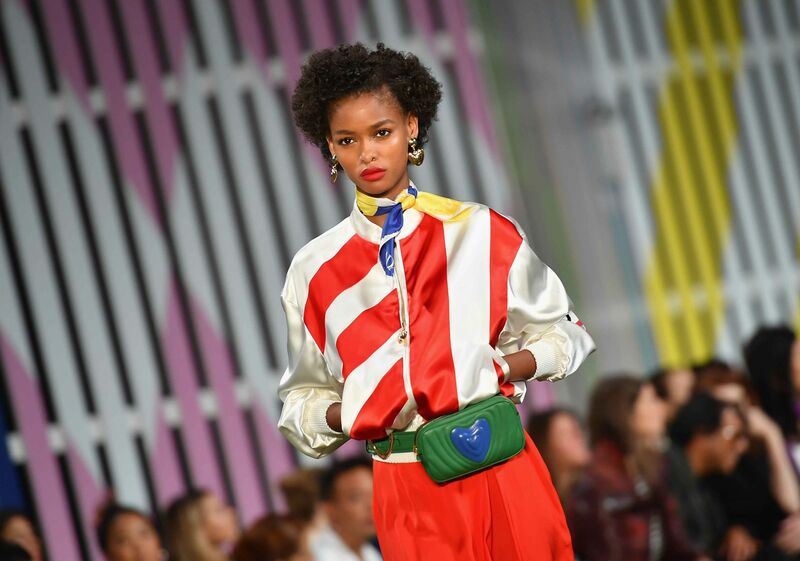 Once reserved for unfashionable dads, tourists and beer aunties, fanny packs have slowly snuck their way into the fashion mainstream and are set to become an essential accessory this year. Luckily for us, the ones that are populating the runways aren't the same garish nylon ones we used to carry. Designers have given this controversial bag a modern makeover by creating luxe versions in leather with sleek silhouettes or a street wear twist with huge, graphic logos. And if carrying a bag around your waist is still not your thing, you could try slinging it over your chest for an updated look.